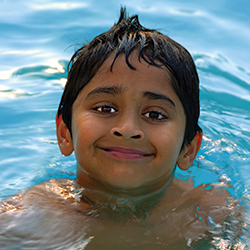 Salem Swim provides swim classes based on age and ability. 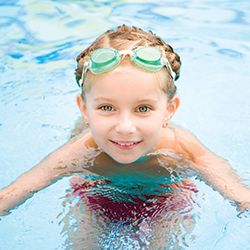 With curriculum approved by the United States Swim School Association’s established guidelines, this isn’t your typical kick and splash class. Our instructors are trained to guide children with encouragement through developmentally appropriate activities that promote safety and teach children to swim well. From non-floaters through competitive swimmers, our priority is to teach children to swim well and to love and respect the water. What is the right level for my school aged child? UNSURE OF YOUR CHILD’S LEVEL? CALL TODAY FOR YOUR FREE EVALUATION! 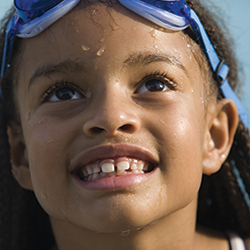 This beginner class is designed to help children become independently comfortable in the water. As children learn to control their breathing, balance in the water, and to calmly go under the water, they will lay the foundation to move confidently through our curriculum. 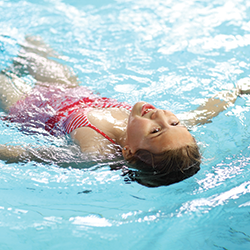 In this advanced beginner class, students learn to move through the water by themselves, to float independently on both their front and back, to retrieve objects from the bottom of the pool, and more. Prerequisite: Children must be comfortable in the water without floaties, be able to calmly lie in the water on both their tummies and their backs with help (not floaties), and to comfortably go under the water by themselves. 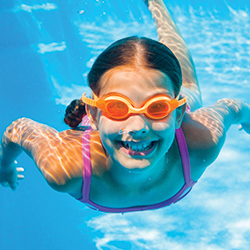 Please review our Learn-to-Swim Class Policies for more additional information. Students in this class will increase their independence and swim distance, and learn to roll over from swimming on their stomach to floating on their back; achieving an independent breath. Additionally, Level 3 students are introduced to elementary backstroke movements, dolphin kicks, breaststroke kicks, and more. This class transitions students from safety swimming with the rollover breath to learning the proper techniques of the competitive freestyle stroke with side breathing. Proper breath control technique is stressed as students move into building endurance and learning the technical breakdown of the freestyle stroke. In addition, students perfect the backstroke, elementary backstroke, and strengthen their breaststroke and dolphin kicks. Perfect for beginner summer swim team competitors! Prerequisite: To be placed into this class, students must be able to swim at least 10 feet, roll over to back float and take breaths to rest, and roll back over to swim forward. The traditional freestyle stroke, with alternate side breathing, is learned in Level 5. In addition, students continue to build their swim endurance and learn the breaststroke and butterfly strokes. Perfect for intermediate level summer swim team competitors! Prerequisite: To be placed in this class, students must be able to swim freestyle with side breathing 25 feet and swim backstroke. 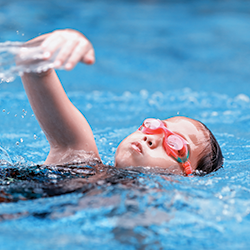 This supplemental class is designed to prepare students for future swim team competitions, as well as to provide fun exercise, and practice for those who just love swimming. This is a 2x/week program. Swimmers must enroll in both of the Swim Team Prep Classes OR be concurrently enrolled in a weekly Level 5/6 class (Level 4 allowed by teacher recommendation). $109 for 2x/week. For more information, click here. At this level, students increase their freestyle and backstroke endurance and perfect the breaststroke and butterfly. Perfect for summer swim team competitors who want to keep their skills sharp! Prerequisite: To be placed in this class, students must be able to swim freestyle with alternate side breathing 25 feet and swim backstroke 25 feet. We are PROUD to offer Capital Martial Arts…the most well-rounded training in the area with perfect programs for everyone!